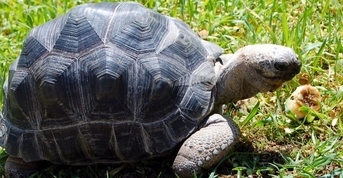 FreshMarine.com - Aldabra Tortoise - Geochelone gigantea - Buy Aldabra Tortoise Now and Save! Geochelone Gigantea also known as Aldabra Tortoise is the second largest tortoise species but despite of its weight and size Aldabra Tortoises are not as slow and clumsy as they seem to be. The individuals can reach over one meter in length and can weigh more than 500 pounds and still they can move about swiftly and are supple enough to stand on their hind legs. Females are generally smaller than males, with standard specimens measuring 35 inches in length and weighing 150 kilograms. A life over 100 years is granted to Geochelone Gigantea. Consumption seems to top their list of activities as the mornings and evenings are spent eating while the hotter parts of the day is spent in the shade or in shallow water holes. The carapace is a brown or tan colour enormously dome-shaped which protects as armour, the soft and susceptible body of the Aldabra Tortoise underneath. Front and back feet both have powerful claws. The tail, though short, also has a claw-like spur on the tip. The long neck helps to tear leaves from the branches higher up trees. Geochelone Gigantea�s sexual maturity is determined by size and not by age. They reproduce when they reach almost half their ultimate size. Shallow nest is needed for laying eggs and a female can lay clutches of 12 to 14 eggs a year. Hatching period occurs between early October and mid December. The complete population of Aldabras Tortoise is constrainedto the Aldabra Atoll. Grasslands, low scrub, mangrove swamps and coastal dunes are their favourite habitats. Largest concentration is found on the grasslands named platins. Geochelone Gigantea is the largest animal in their natural environment. As Aldabras live long and are very large in size, they need a special spacious artificial habitat and need time dedication. Ideally, they should be kept outdoors, though Aldabras less than two years can be kept indoors in tank. After they reach about two years of age, they need ample of sunlight and space to roam about. The bigger the outdoor enclosure, the better it is. While keeping them indoors, make sure to use crushed coconut for the substrate of the tortoise enclosure. The temperature of their tank should be between 80 to 90 degrees Fahrenheit. UVB light is also an essential which will provide vitamin D3, required for the proper growth and development of Geochelone Gigantea�scarapace. Aldabra Tortoises are generally herbivorous. Their diet constitutes of grass, leaves, plants, stems and weeds. They do eat insects and dead animals, even their own kinds but this is done especially to gain enough nourishment for survival. They are commonly found in places called �Tortoise Turf�, an area that contains 20+ different grass and herbs species. In captivity they eat grass, flowers, cactus and all kinds of leafy greens. They obtain maximum of their moisture from their food, hence they are fruit lovers, especially apples and melons. Aldabra Tortoise is the last identified survivor of a set of giant tortoises previously found in Madagascar and the Seychelles Islands.